Earlier this week I had a storytime that went really well. It was that perfect blend of happy kids and fun stories that made for a really nice experience (for kids and librarians alike). We always start with the song "Shake Your Sillies Out" so they have a chance to move around a little bit and get some of those wiggles out. 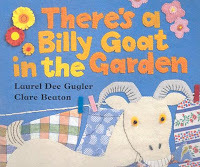 Then w e read There's a Billy Goat in the Garden by Laurel Dee Gugler with really neat illustrations by Clare Beaton. The pictures are done in fabric and there are lots of nice details to appreciate. It's also a big, colorful book which makes it great for storytime. The story is simple - there's a billy goat in the garden and he will not come out. All of the animals try to get him out (and the kids chimed in with each animal sound), but none succeed until the tiny bee buzzes in and the goat goes running. 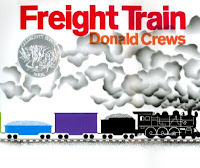 Next up was a big book of Freight Train by Donald Crews. This is a perennial favorite and kids named the colors of the cars and pretended to be trains with us. Since they had just named lots of colors, we went right into If You're Wearing Red Today, which is always a fun song to get the kids moving a little bit. 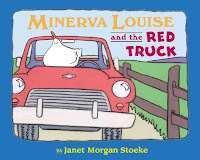 Next up w as a personal favorite of mine: Minerva Louise and the Red Truck. Minerva Louise is an oblivious chicken who always seems to get things mixed up. If you've got a lively crowd, they'll find the mix-ups hilarious. Sometimes this one can go over the kids' heads (or maybe they're laughing on the inside... who knows...), but today it was just right. Then my coworker B whipped out his uke and we all sang "Oh Hey, Oh Hi, Hello". This is a really fun song! We taught the kids the chorus (Oh Hey, Oh Hi, Hello) and then as you go through the verses you sing the chorus in all different ways - quiet, loud, sad, mad, and underwater. B encouraged everyone (kids and grownups alike) to sing along and it was quite fun. You can find this song on Jim Gill's CD Jim Gill Makes it Noisy in Boise, Idaho. If you haven't checked out Jim Gill's CDs, you really should. They are great fun and we use them all the time in our storyti mes! You'll notice that we don't generally stick to themes for storytimes. Our philosophy is that it's better to have a handful of great readalouds than use a mediocre book or two just because you're sticking to a theme. 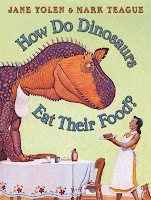 I'm in love with the dinosaur books. I must own them, I just must. Yay! I love it when you share your storytimes, and I just started posting some of mine. Thanks! Thanks for posting your storytimes. I do storytime at the bookstore I work for and it's hard to come up with original ideas. I feel like I read the same things over and over. I appreciate the new thoughts. Boy, but I love Jim Gill. I keep trying to get my co-children's-librarian to learn how to play "Oh Hey, Oh Hi, Hello" on his guitar, but no luck so far. He does play Gill's jumping and counting song (Is it called "Jumping and Counting?" Maybe. ), though, which is great fun, too. I consider myself really lucky because Jim Gill's local and we've had him at my library. I may get to see him again at our preschool networking group next month. He's so very nice and presents a great show!